Outlook Express signatures are repetitive messages, like disclaimer messages, business contact information,etc. that are added to the bottom of your emails. Signatures can be simple text signatures or HTML signatures containing images,logos,links etc. They can be added automatically to all sent messages or manually to individual messages. You can have more than one signature file,but only one can be used at a time. Email signatures should not be confused with digital signatures that are used to electronically identify the sender of a message. To create and use a signature proceed as follows. 3.Click New next to the Signature box. Text appears in the Signature box and “signature#1” is highlighted. Click rename and name it something more meaningful. Here I have renamed it to business signature. 7. When you create a new message the signature file will automatically be added to the message as shown below in screenshot 2. 1. 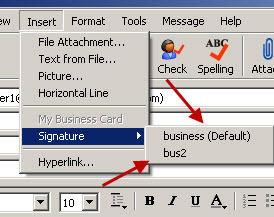 The advanced button visible in screenshot 1 can be used to add the signature to multiple email accounts if you have more than one email account configured. 2. The file option shown in screenshot 1 can be used to add text or HTML content from an existing file as the signature. If you want to add signatures containing images,logos,links etc. then you need to use this option. Note: If you have multiple signatures you can choose which one to add. If you have a web page editor like FrontPage them you can use that to create file. In this example we will code the HTML ourselves and create it using notepad. I am going to create a simple file that will include a picture and my name and telephone number. When you have finished save the file as signature1.htm (here I’ve saved it to c:\signatures\signature1.htm. signature file and then click ok. (see below). 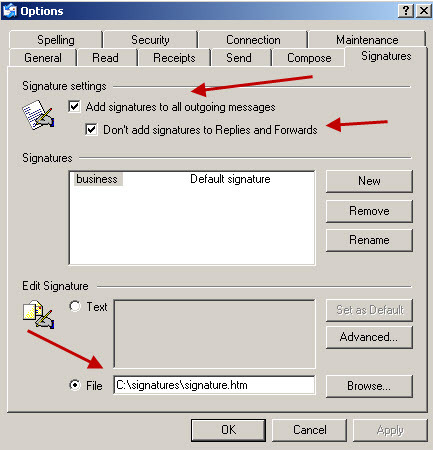 Enable the add signature to all outgoing messages to have the signature add automatically to each message. I enable the Don’t add signature to replies and forwards. 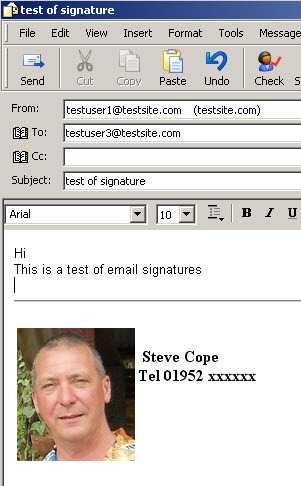 When you create a new message you will see the signature at the bottom of your email. Note: If you use HTML signatures then you must send the mail as HTML and the recipient must support html email to see it.